A Midsummer Night's Scream - SAW | Warped Factor - Words in the Key of Geek. We're staying up all night for our Misummers Night's Scream, and now it's time for Tom Pheby to get the SAW. I have to admit that it takes a lot to actually scare me whilst watching a horror Film. I tend to find that there's not much that we haven't been served up before, and so certain aspects become repetitive within the genre. Like when Hank announces that he's going outside for help and we all think ... Hank's a goner. Or When Cindy (these are made up names by the way) decides to investigate the noise in the basement... Bye Cindy. Or when Chuck finds a box that was hidden behind a wall for a bazillion years and decides to open it whilst announcing "It's only a box"! The other Gripe I have is that the Music goes all orgasmic before something happens indicating that someone is about to be bludgeoned, beheaded or killed in some unsavory way. And then along came SAW. My favourite horror movie to date, although it's not 'horror' in the traditional sense of the word and perhaps that's why I like it so much. SAW is more of a predicament and circumstances kind of Film, similar to 2003's 'Identity' with John Cusack. Here we have a serial killer (Jigsaw) who has so much time on his hands that he comes up with a series of unique and ridiculous challenges to see who has the will to survive. Two Men awake in a ramshackled bathroom, both in leg irons and confined to opposite ends of the room - slightly reminiscent of a stag night that got out of control. The two men have never met and apparently have no link. The SAW goes a bit Cluedo - a blood stained body face down, a tape recorder, a gun and a Saw. But no key, damn it, this conundrum may go on for a while. The captives have no idea why they are there, how they will escape, who holds them captive and what they have done to deserve such treatment, let the game begin. There's no easy resolution here. No Colonel Mustard with the spanner in bathroom moment. It's a very deliberate and slow burner that allows the audience to experience the moment as it unfolds. It's not that gory, but nor is it that predictable to make you groan aloud, there are enough surprises to keep you captivated throughout. It's clever, slick and intriguing, almost like a play as the two main characters interact to win their freedom. 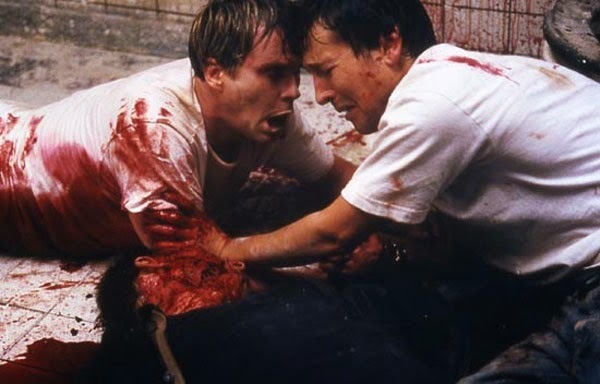 Baby faced Cary Elwes plays Dr Lawrence Gordon and Leigh Whannell (who also co-wrote the script) stars as the hyperventilating Adam. He appears in a state of wide eyed anxiety and on the verge of screaming for mercy for most of the film. There is tangible tension with a few oooo moments along the way. SAW that plays with our insecurities, the way Jigsaw toys with his victims and has thought the plan through in such meticulous detail is a joy. 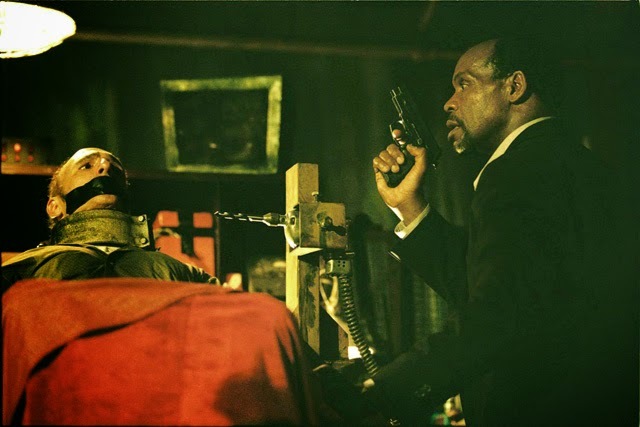 We even get to see a feverish Danny Glover as Detective David Tapp who is borderline obsessed with catching the twisted and sadistic murderer but finds himself up against the clock, which as a subplot adds to the whole pace and energy of the piece. Jigsaw is a little too far out there at times and could have been reined in a bit. Maybe they should've looked to the character of Hannibal Lechter for example, ordinary looking but so depraved and scary that he tends to curdle the milk on your cornflakes. I like Horror that chills me by way of thought process. Horror seemed to suffered a melt down in the Eighties as it got stuck in a dire rut of predictable carnage and wading through gallons of blood, but thankfully the genre is now back with a bang. 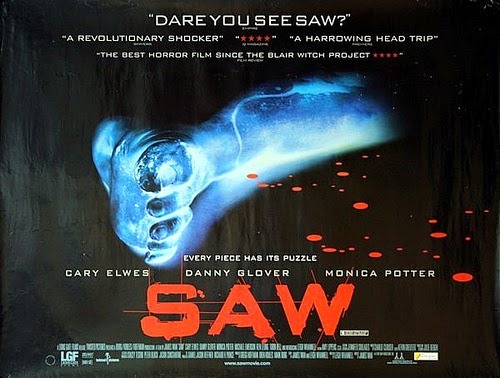 SAW was a film that made you sit up and think, made you feel slightly apprehensive and uncomfortable, not least for being chained up in a toilet with a stranger and a corpse!